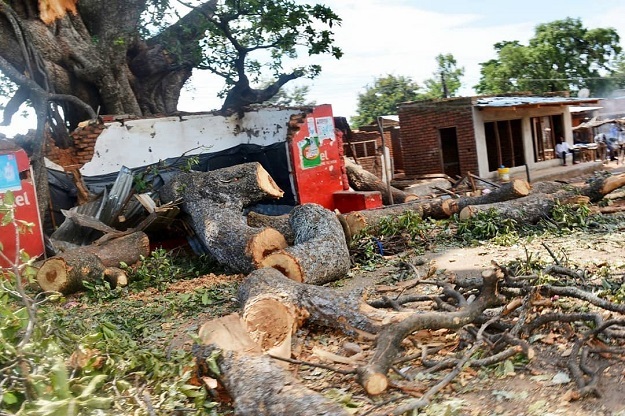 Residents of Mthundu Trading Centre in Mangochi are mourning the death of a 35-year-old man, identified as Amadu Makwemba when big tree branch fell over shops, destroying property worth close to K11 million. Mangochi Police Station Deputy Public Relations Officer (DPRO), Sergeant Amina Daudi said during the morning of the fateful day the branch of a big tree fell over four shops destroying grocery merchandise, which led to the blocking of the road. “After noticing that the road had been blocked, around 6 am, members of the community assembled at the trading centre to clear the road and the surrounding area in order to resume their usual businesses. “In the process of clearing the place, another tree branch felt off from the same tree hitting Makwemba in the chest and killing him instantly,” she said. She said two other people sustained minor injuries in the accident and were treated as out-patients at the same St. Martins Hospital. The DPRO said postmortem conducted on the remains of Makwemba at Mangochi District Hospital established that death was due to internal bleeding from multiple fractures in his body. Makwemba hailed from Steven 2 Village in the area of Traditional Authority (TA) Chowe in Mangochi.